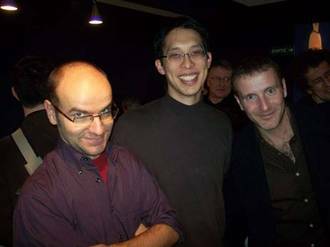 11 posts categorized "GENE YANG, guest blogger"
Dargaud, the French publisher of American Born Chinese, invited me across the pond as their guest, and I got to spend four days rubbing elbows with many of the most brilliant cartoonists in the world. Graphic novels from practically every comics-reading culture were on display. On my first afternoon there, I sat down at my publisher’s booth to do a signing. I started off signing books just like I do in America: the reader’s name in all caps, a happy little message, my loopy signature, and a quick doodle of the Monkey King’s head to prove I’m the guy who did the book. About five books in, I began noticing that the readers were all walking away with frowns. Had I spelled their names wrong? Did I smudge the drawing with my hand? Was it a French custom that I wasn’t familiar with, frowning at the sight of a newly signed book? Then I took a good look at what the French cartoonists around me were doing. The one on my right was crosshatching a carefully rendered fight scene on a jacket flap, while the one on my left was finishing up a watercolor portrait of her protagonist on the bottom half of a title page. I realized my little monkey heads just weren’t cutting it. 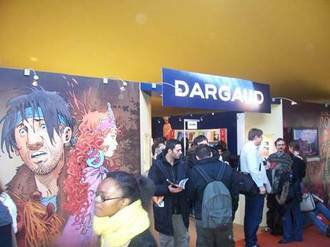 French comic book readers expect sketches that are works of art rather than just sketches, and French creators are more than willing to oblige. In an hour, a cartoonist would sign maybe eight books tops, and everyone was happy about it. The readers didn’t complain about the wait, and the cartoonists didn’t complain about cramped drawing hands. I had to step up my game. The elaborate sketches were indicative of a general atmosphere that pervaded the entire show. 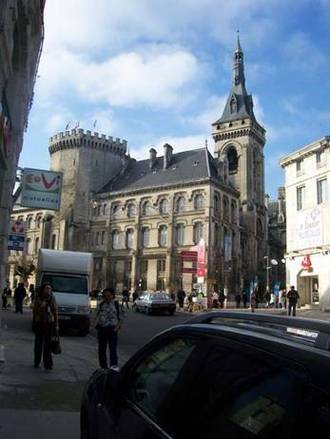 The emphasis of Angoulême wasn’t on autograph collections or limited edition toys or blockbuster movies or skimpy costumes. The emphasis was on the art of comics. Everything else took a backseat, and everyone understood this. Displays of original comic book art adorned the halls, just as they do at American conventions, only in Angoulême these displays weren’t afterthoughts -- they were the main attractions. Now, don’t get me wrong. I love the zaniness of American comic book conventions. I love watching Jack from Jack-in-the-Box and the King from Burger King engage in a light saber duel before a rapt audience of classic Nintendo characters. I love hearing Klingons shout Klingon jokes to other Klingons, and then laugh hearty Klingon laughs. I even love bumping into overweight Optimus Prime as we both search for those elusive issues of The Warriors of Plasm in an endless sea of dollar bins. But to be at a festival where comic books are seen -- not just by the professionals, but by pretty much everyone in attendance -- as an art form in every sense of the word “art”… this was as close to Hicksville (a geeky way of saying “comic book heaven”) as I’m ever going to get. The draftsmanship of the French creators certainly reflected this attention to craft. I watched in amazement as fully-formed scenes spilled out from their pens without a single pencil sketch line to guide them. I met cartoonists who had mastered a half dozen media to tell stories in a half dozen genres. The panels that make up their graphic novels resemble small, carefully-composed paintings, with conscious thought evident behind every brush stroke and color. There is much that we Americans can learn from the French. Of course, the reverse is also true. After all, Will Eisner and Charles Shultz were Americans. And maybe that’s why I feel so lucky to be working in comics right now. The three major comics traditions of the world -- Japanese, French/Belgian, and American - are in the midst of a Great Cross-Pollination. More often than not, cartoonists today can trace their influences around the globe, to other cartoonists with whom they’d barely be able to sustain a verbal conversation. And yet, through this medium that combines the universal communication of pictures with the specific communication of words, we’ve found a profound way to share with one another. It’s an exciting time to be in comics. As a friend remarked to me recently, it’s like being at the birth of rock-and-roll. 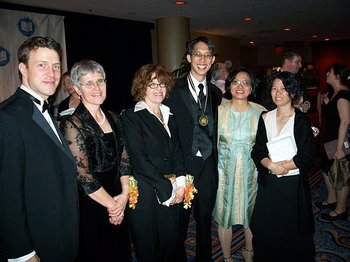 AMERICAN BORN CHINESE IS THE FIRST GRAPHIC NOVEL TO WIN THE PRINTZ AWARD. More about it all soon! 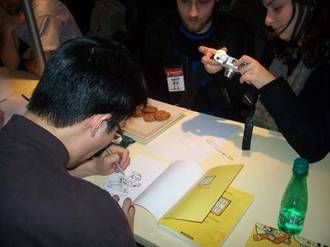 Young starry-eyed comics artists now aspire to the glitz and glamour of the graphic novelist life...! They give up steady jobs in animation and videogames, and come to publishing seeking fame and fortune. Um... Well it seemed that way for a night, didn't it? Above, Gene signing lots and lots of books at the Donnell Branch of the NY Public Library, one of the surrounding events that day. Gene, Theresa and Gene's mother and father, who flew up from San Francisco for the event. 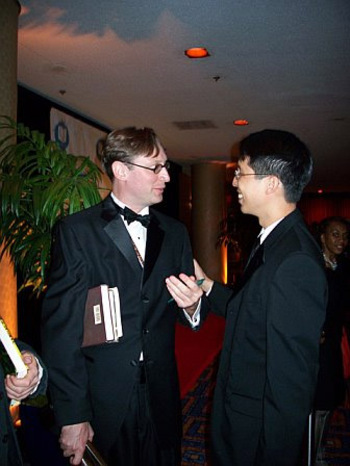 Gene thanks and congratulates the winner of the National Book Award for Young People's Literature, M.T. Anderson. Part of me wonders exactly how serious Tony Long is. After all, his column is titled "The Luddite." He has an online persona he needs to uphold. To be honest, I can see where he's coming from, especially as an educator. I, too, worry about the declining literacy of our students. However, studies have shown a link between comics and increased literacy skills. Often, comics readers are just plain readers, and many fans of prose literature attribute their love of reading to comics. We also can't forget that we describe the act of reading comics as just that: reading. There's no other word that can adequately describe how we interact with stories told in that medium. 1. Sequential images (comics) and prose are different. #1 is much more intriguing. It seems like a true statement, and in many ways it is, but prose has its roots in sequential images. The two aren't as separate as they might seem. Many written languages (Chinese, for example) still bear a lot of the artifacts of their pictoral ancestry. Are works created in Chinese less literary than works created in phonetic languages simply because Chinese is more pictoral? How about works created in ancient Chinese, in which the characters clearly resemble what they represent? I don't think the boundary between prose and sequential images is that stark, and I think the generation raised on multimedia documents understands this. In fact, I believe this new generation actually blurs that boundary. My students are used to reading documents made up of words and images, sound files and movies. They aren't disturbed when these elements bleed into each other - when words use visual devices to enhance what they're communicating, when images are made up of textual elements. The nomination of a graphic novel for the National Book Award, especially in the YA category, shows that the judges are aware of this. I also find evidence for this boundary blurring in M.T. Anderson's The Astonishing Life of Octavian Nothing, one of my fellow nominees. Octavian Nothing is a brilliant book. Please go read it if you haven't. One of the most intriguing aspects of the book (for me, at least) is Anderson's use of visual storytelling devices. For example, Anderson uses different fonts and font styles to communicate time, place, and emotion. There are other, more striking, examples. In an early chapter, the protagonist opens the door to a forbidden room and is startled by a sign hanging on the wall, a sign reveals the secret behind the peculiarities of his existence. That sign is DRAWN in the middle page. It slaps you in the face on the page turn, much as it does Octavian when he opens the door. Towards the end of the book (here comes a spoiler, so go away until you've actually read it), after Octavian suffers a gruesome personal tragedy, entire passages of the book are scribbled out with what looks to be a crow quill pen. The pages of angry lines and ink splotches communicate as much or more about Octavian's state of mind as the paragraphs that came before. No one would argue that M.T. Anderson's book is not a novel, but does Anderson's inclusion of graphic devices dimish the "novel-ness" of Octavian Nothing? Does it make Anderson less of a "novelist"? Not to me. To me, it shows that he committed to the telling of his story above all else, and that he is willing to use whatever devices modern printing technology affords to communicate effectively. To me, it makes him a storyteller worthy of my admiration. I didn't get the call from Harold Augenbraum, Executive Director of the National Book Foundation to tell me the good news. He called on Tuesday afternoon, and I was in my classroom teaching. Afterwards, I heard the message (he told me who he was, without telling me why he was calling) but I couldn't call back. Tuesday was a big day for our school. It was the end of a marking period, and as the school's database manager it was my job to oversee the printing of the progress reports. The vice principal, the academic coordinator, and I holed ourselves up in the computer lab with a pizza and a 2-liter of Pepsi. We didn't emerge until 8:00pm, and by then it was too late to return a call to New York. I forgot all about it by the next morning. I went about my daily routine until Mark called right after my first period class. I didn't - and still don't - know quite how to react. I can't say it's a dream come true because it never even would have occurred to me to dream it. It wasn't in my reality. I was speechless. For the rest of the day, I watched my e-mail inbox fill with congratulatory messages from friends, relatives, and artists I've long admired. I went home and my wife hugged me for a long, long time. More cultural differences came out during the two interviews. The Chronicle focused more on my methods of working and how my experiences growing up played into the book. The World Journal focused more on my family and their reactions. They even asked for my parents' phone numbers. The whole week has been a blur- a big, colorful, surreal blur. It's still hard for me to believe that it actually happened. My one regret is that I forgot to shave before the reporters came. 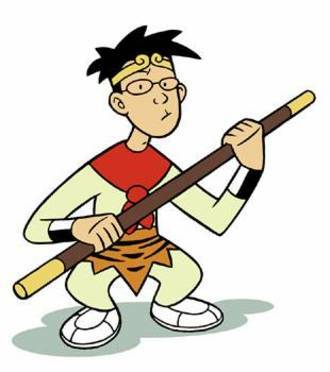 Some folks who’ve flipped through American Born Chinese have asked about the star of the third storyline, Cousin Chin-Kee. What would possess a self-respecting Asian-American cartoonist to draw a character like that? Several years ago, just before my wedding, I spent an afternoon organizing things in my childhood bedroom. 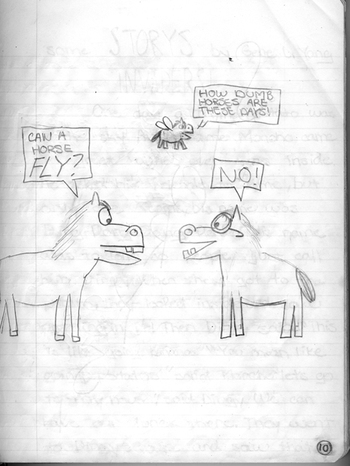 I came across an old notebook filled with gag cartoons I drew in second grade. I’ve been told that Jeff Smith, the genius behind the cartoon epic Bone, first created Fone Bone and Company in kindergarten. In many ways, Cousin Chin-Kee is my Bone. He’s a character conceived in childhood who’s stayed with me ever since, consciously or not. 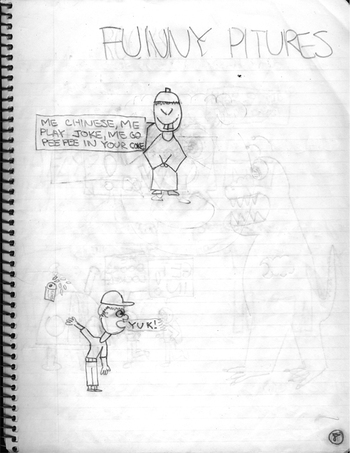 American Born Chinese is an exploration of WHY Cousin Chin-Kee is my Bone. And just as Fone Bone now looks much the way he did in Jeff Smith’s kindergarten sketches, so Chin-Kee’s current design remains consistent with that initial second grade drawing. I’ve got to stay true to the source material. There is always the danger, of course, that by making a comic book about Cousin Chin-Kee I’m helping to perpetuate him, that readers – especially younger readers – will take his appearance in American Born Chinese at face value. I think it’s a danger I can live with. In order for us to defeat our enemy, he must first be made visible. Besides, comic book readers are some of the smartest folks I’ve ever met. They’ll figure it out. Second, unlike Jin, I had white friends in elementary school. My best friend in third and fourth grade was white (and nothing like Jin’s “friend” Peter Garbinsky). Finally, the true face of racism, especially in as diverse a community as the San Francisco Bay Area, is much more complex than what is portrayed in the story. For instance, my most consistent childhood tormentor was an East Indian classmate. We hurled racist insults at one another with a determined ferociousness, usually in front of a white audience. I didn’t want to be friends with him. I didn’t want to from the deepest parts of me, for reasons I didn’t understand at the time. He followed me around the playground for several days, and only stopped when my best friend and I threw tanbark at him. American Born Chinese, my latest graphic novel, consists of three distinct storylines. The first retells the story of the Monkey King, an ancient Chinese folk hero who is ubiquitous in Asia. The Monkey King first came into public consciousness as the protagonist of the fourth century novel The Journey to the West, one of four books that make up the Chinese literary canon. Since then, he’s transcended his literary roots and become a pop culture icon, something of a Chinese Mickey Mouse. There are movies, picture books, lunch boxes, T-shirts, television shows, toothbrushes, and almost any product you can imagine featuring the Monkey King. Oh, and comic books. Lots and lots of comic books. Like most Chinese children, I first heard the Monkey King’s exploits as bedtime stories from my mom. Almost before I started drawing comics, I knew I wanted to do a comic book adaptation of the Monkey King. But as I became more and more familiar with the character, there seemed to be less and less of a point in doing so. There were already so many Monkey King comics that he’s practically his own genre. The popular manga series Dragonball Z is a riff on The Journey to the West. Heck, even Osamu Tezuka, Japan’s God of Comics, did his own interpretation. What new insight could I possibly bring to the character? I eventually came up with the idea to use the Monkey King as a lens through which to reflect on my own experience as an Asian-American. As I began writing the script, however, I realized that this would necessitate one drastic change to the original story. At its heart, The Journey to the West is a Buddhist morality tale. In the original, the Monkey King raises havoc among the gods of all other traditional Chinese religions, and it is only the Buddha that is finally able to put him in his place. In American Born Chinese, I’ve replaced the story’s Buddhist underpinnings with Christian ones, drawing from my own faith. 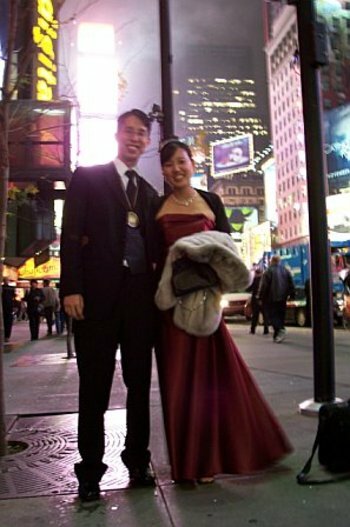 Christianity, you see, lies at the very center of my identity as an Asian-American. 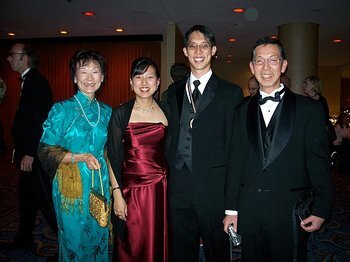 I would even go so far as to say that Christianity is a vital part of “The” Asian-American experience. For proof, simply visit a Christian student group on any university campus. More likely than not, you’ll find a sea of Asian faces. By adopting this ancient Western religion that is both a part of and at odds with contemporary Western culture, we attempt to make sense of ourselves. But is it okay for me to take an age-old Chinese folk tale and rip out its Buddhist heart? Derek Kirk Kim, one of my best friends and a decidedly non-Christian Asian-American, questioned me on this after an enthusiastic reading of my script. “How would you feel if someone took one of your stories and made it Taoist or Muslim or atheist?” he asked. I’ve read that many scholars believe the Monkey King himself was derived from Hanuman, a Hindu monkey-god. The original author (or authors – no one really knows for sure) of The Journey to the West took the Hindu source material (perhaps without knowing it) and used it for his (or their) own religious purposes. Furthermore, coincidence or not, this trickster monkey deity is echoed in religions and mythologies all over the world. So in a very real sense, the Monkey King is universal. He’s been around a long, long time, and I think he’s sturdy enough to follow us wherever we go, to embody whatever philosophies and beliefs we arrive at. To be honest, I’m not entirely comfortable with that answer. 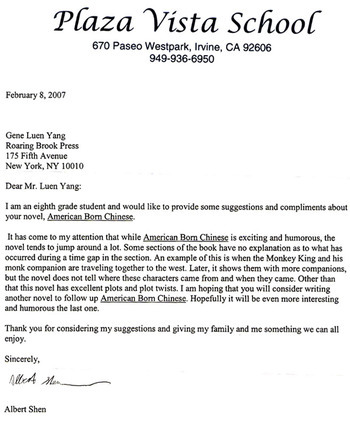 But I was comfortable enough with it to be able to finish American Born Chinese, and maybe that’s all that matters.